Google has been rumoured to be in 'late stage' talks to buy microblogging site Twitter, although the company is not commenting on the story. 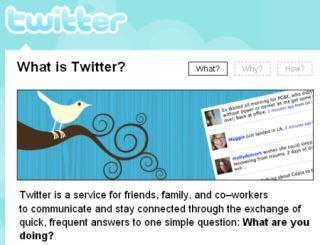 Twitter has been the phenomenon of 2009, becoming a huge success and attracting both a massive audience and huge media coverage. Links to Google make a lot of sense, which is why TechCrunch's revelation from two unnamed sources suggesting talks were proceeding has hit the headlines. "Here's a heck of a rumor that we've sourced from two separate people close to the negotiations: Google is in late stage negotiations to acquire Twitter," said TechCrunch. TechRadar rang Google for any official comment and were told by a spokesman: "We don't comment on rumour and speculation." Despite its massive audience Twitter has yet to find a model that makes money from its popularity. In terms of monetising online traffic, there is no biggest player than Google – which has used its advertising wing to move from a brilliant idea to a massive business. A third unnamed source suggested to TechCrunch that talks were still in the early stages, but TechRadar will be following the story as it continues to evolve.